Granite outcrops are either inselbergs (isolated rock hills or knobs) or monoliths, (a single massive stone or rock). Erosion usually exposes these geological formations, which are often made of very hard and solid metamorphic or igneous rock made from granite. Rising abruptly from the gently sloping or level surrounding plain, they dominate the surrounding bushland. When exploring the outcrops ensure that you wear suitable footwear. In summer it can be hot on the rocks so take plenty of water, a hat and sun screen. In winter the rocks can be slippery and it can be windy on top. So rug up and enjoy! Listed below in alphabetical order are various granite outcrops to explore in the Wheatbelt. Baladjie Rock is a popular picnic spot for locals and visitors to the Westonia Shire. No facilities are available. It is located on the sealed Koorda-Bullfinch road, 42km north of Westonia and 55km north west of Southern Cross. The extensive rock outcrops are situated in an attractive woodland adjacent to the Baladjie Lake Nature Reserve. A climb up the main rock affords a spectacular view over the lake system and surrounding landscape. Ornate Dragon Lizard (Ctenophorus ornatus) is a popular resident at Baladjie Rock. This Outcrop 35km north of Beacon provides excellent views of both cropping and pastoral country. Billiburning Reserve displays it’s beauty in Spring with the masses of wildflowers. The Outcrop is also the location of a pioneer well and Gnamma hole. Beringbooding Rock, located on the corners of Beringbooding Rd and Cunderdin Rd 65km north east of Mukinbudin, has the largest rock water catchment tank in Australia. It was built in 1937 and holds two and a quarter million gallons. “Sustenance Labour” was used to build the tank at a cost of 10,000 pounds. Beringbooding has an amazing balancing boulder, a huge gnamma hole and some of the Kalamaia Tribes paintings of hands in a cave at the rear of the rock. Two early pioneer wells are nearby. Spring finds the Pink Ti-tree, Heartshaped Leaf Eucalyptus, melaleuca, acacia, grevillea, hakea, calothamnus, eremophilia, cassia, Quandongs Sandalwood, and the native orchids flowering. Later into October and November the Kunzia pulchella and One-sided Bottlebrush flower profusely. Many birds inhabit the area. Located 9km north of Kununoppin within the Billyacatting Reserve. This large granite outcrop has 2 interpreted walk trails. One loop trail around the base of the rock and one to the peak for amazing views. 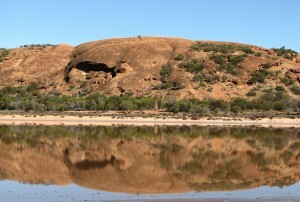 Situated 2km east of Bruce Rock in a nature reserve on the Bruce Rock East Road. There are two pioneer wells located at the picnic site at the foot of the rock and good walks are to be enjoyed over the rock outcrop. 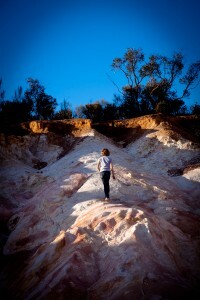 Located 70km east of Kulin, off the Holt Rock Road on route to Wave Rock, Buckley’s Breakaway is a picturesque land form where erosion has cut through the orange laterite and formed spectacular white cliffs and gullies from the underlying clay. The area is perfect for a picnic and a photographers delight. At the site you will find interesting interpretive information about the area, The gully is dominated by Cypress Pine, Blue Mallet and Box Poison, but it is the top of the “breakaway” which carries the most interesting plants. It’s the natural garden with something in flower all year round. In the shelter of the shrubs, look for delicate orchidstrigger plants and sundews. The perfect place to absorb the rolling landscape and it’s easy to see why it’s been a popular picnic spot for more than a century. Sitting amongst the sheoak woodland you’ll probably glimpse a variety of birds and, at the right time of year an abundance of colourful wildflowers including a beautiful display of orchids. Turn south off the Great Eastern Highway 10km east of Meckering and 12km west of Cunderdin onto Collins Road. A pleasant drive approximately 20km from Hines Hill past Fisher Rock, North on the Nungarin Road, this is a mass of wildflowers in season. Also known as Brockmans hide out where Brockman, his wife and twelve children took cover under these rock formations when he broke parole and was on the run from police in the 1960’s. A popular picnic spot with an abundance of Orchids in good seasons. Travel 18km east of Beacon on the Burakin-Wialki Road to the narrow track entrance to the well and camping areas. No caravan access. A spectacular natural granite rock and cave formation situated 20km north east of Nungarin along Brown South Road, the Hill abuts Lake Brown. Enjoy great views over the salt lake to the south. Patches of York Gum woodland abut the rock which has stands of red Kunzea pulchella adding patches of colour in late spring. Wedgetail eagles are often seen perched on the Rock. A popular organised rock climbing spot. 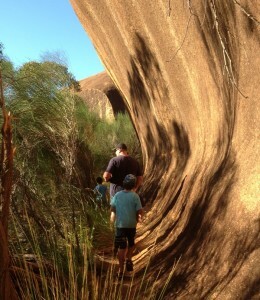 Elachbutting Rock is a spectacular natural rock formation similar in shape to Wave Rock. It has numerous large cavern areas. The name Elachbutting is thought to mean ‘that thing standing’ which is quite feasible as Elachbutting is a prominent landmark standing out from the surrounding countryside. Elachbutting is located 100km north east of Mukinbudin on the Elachbutting Rd. Elachbutting Well is a feature of this area. The well can be found to the rear of the rock and quite a distance between the well and the base of the granite rock. The well is circular and extremely deep and there are approximately three to four rows of dry wall stones then either clay or stone that looks if it has been drilled. The water seeps in at the base of the well through the rocks. This well is typical of wells that were built within this area and provided a natural water supply to the settlers. Parking facilities and a walk trail have been developed jointly by the Westonia Shire and The Department of Environment and Conservation. 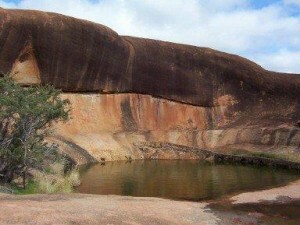 Situated in the Yilgarn Shire 25km south east off the Great Eastern Highway from Parker Rd out from Moorine Rock, Frog Rock is a popular picnic spot. 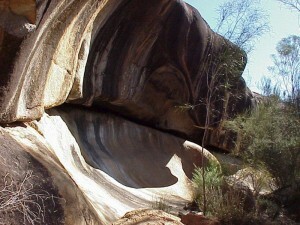 A small dam is located beneath a wave rock formation. There is a fine stand of gimlet on the road into the site and wildflowers abound in the spring. Located 20km south east from Corrigin, Gorge Rock is a natural pool which was once the swimming hole, before a pool was constructed in the townsite. It offers spectacular panoramic views of the surrounding farmland and countryside around Corrigin. Enjoy the short walk through the picturesque bushland to get to the rock pool. 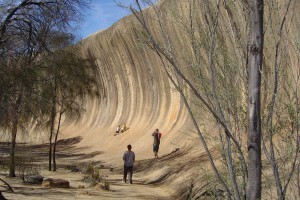 Situated approx 30km east of Narembeen, along your ‘Pathway to Wave Rock” experience. This granite outcrop also boasts a natural amphitheatre that has been carved out of the rock over years of weathering – it can be found walking from the carpark along the trail. For the more energetic, the view from the summit offers spectacular views of the district. Take your time, read the plaques at the little dam and discover a piece of farming history. Located at Hyden’s Wave Rock. Erosion sculptured the rock into the shape of a huge yawning hippo. Located at Lake Koorkoordine, 8km north of Southern Cross on the Bullfinch Road, in the Golf Club Common. Hunts Soak is one more of the remarkable daisy-chain of wells and soaks which provided the Goldfields Track with water until O’Connor built his pipeline. These wells were always built adjacent to granite rocks because of the water soakage from the rock. 20km east of Kulin on Holt Rock Road (follow the Tin Horse Highway), a shady picnic spot at the base of Jilakin Rock. An easy climb to the top provides spectacular views of Jilakin Lake and the surrounding Wheatbelt. Wildflowers form a wonderful display during August and September. 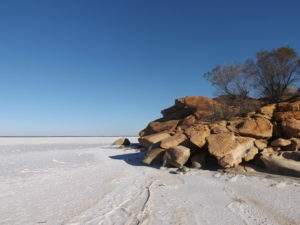 Jilakin Rock also boasts the most isolated known stand of jarrah (150 kilometres from the main jarrah belt), surviving on the water run off and quarry soils at the base of the rock. The Karalee reservoir,is located 7km off the Great Eastern Highway 50km east of Southern Cross. A natural rock formation adapted to maximise the catchment, delivery and storage of rainwater that was essential in railway development to the Goldfields region. It is now a popular picnic spot and camping spot on the Golden Pipeline heritage Trail. Located 25km north of Bodallin on the Bodallin North Rd, Keokanie Rock is a stop off place on the way to Baladjie Rock further north. An easy climb to the summit is rewarded by great views. In the patch of tall sheoak on the east side look out for the family of Grey Fantails who will come and check you out. No facilities. Outcrops of granite with wonderful views form the top of the surrounding country side. Located east of Hyden following Hyden East Rd then King Rocks Rd. Situated 40km west of Bruce Rock. 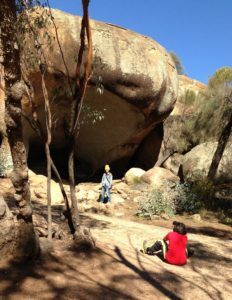 An unspoilt area where a visitor can explore features such as the Wave Wall, Dog Rock, Devil’s Marbles, panoramic views and a fascinating well at least 20 metres deep, three metres in diameter constructed by hand in the early 1920-30’s. Rocks were levered into the soil to line well walls. An amazing engineering feat similar to others built by pioneering drovers to water stock. A free camping/ caravan area has been developed at Kwolyin 9kms south of Kokerbin Rock, with Toilets, campers kitchen, BBQ and covered seating areas. Located south of Bencubbin on Marshall Rock South Road on the way to Pergandes sheep yards. There are 360 degree views of the surrounding productive cropping land. 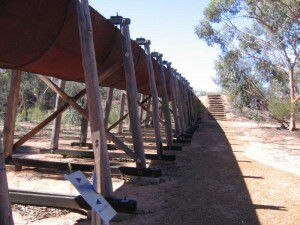 Off Benson Road Merredin, follow the Golden Pipeline signs. A rock wall was built around the contours of the peak which led to a 100m channel and into a 25 million litre capacity storage dam. This water catchment scheme provided water for both the town and the railway. Two walk trails and a popular picnic spot with shady trees. Located 50km north of Koorda on the Kulja-Mollerin Rock Road, it has picnic, camping facilities and a toilet. During late winter and spring this nature reserve has a picturesque display of wildflowers and beautiful panoramic view from the top of the rock. Located around 16km north of Hyden’s Wave Rock, the name Mulka comes from an aboriginal legend believed to be associated with the cave, telling of the sad life of Mulka who was eventually speared to death. Excellent walking trails with interprepation. Toilets available. Located 20km north of Koorda on Newcarlbeon Road, during late winter and spring this nature reserve has a beautiful panoramic view from the top of the rock and an enjoyable picnic area, camping and toilet facilities. Located approx 45km east of Narembeen is a 20 million gallon storage dam completed in 1971 which supplies the Mt Walker farming community. This is a bird watchers paradise! Take in the majestic eucalypts with and under-story of bracken fern. Picnic area, toilets and BBQ’s are available in this tranquil setting. Situated approx 8km from Narembeen and named after John Septimus Roe, Surveyor General, who led an expedition eastwards from York in October 1936. A scenic drive takes you to the peak of this granite formation with magnificent panoramic views of the district – a photographers delight! Roe lookout is also a part of the “Old Prospector’s Trail”. There is limited vehicle access to the top of Roe Lookout, the steep incline is not suitable for caravans. Feel free to park at the bottom and take a leisurely walk to the top of the lookout. Is situated approximately 10km north east of the Westonia townsite, along the Boodarockin Road this reserve protects 806 hectares of granite outcrop, pools, wildflowers, scrub and woodland. It has many diverse species of flora and fauna. Silver Mallee (Eucalyptus crucis subspecies crucis) and Purple Peacock Beetles are some of the rare species found on these granite outcrops. The trig point (HK 148) is set on the highest point of the rock.Towards the rear of the outcrop you will find the cairn of stones depicting the highest point. Situates 12km east of Nungarin a large open rock area with picturesque valley between rocks. A great wildflower spot in season with BBQ facilities. Located 12km NW of Quairading on Toapin Weir Road, the top of this natural granite outcrop offers stunning 360 degree vistas of the area. This weir was listed on the State Register of Heritage Places in 2012. It was the largest and most comprehensive privately constructed reservoir and water scheme in WA. Stairs, guide chains and benches have recently been added up the rock to make it even easier to enjoy, you might even find a geocache or two! Located 16km south west of Merredin on the Bruce Rock Road. Large run-off dam and soak well is part of the Golden Pipeline Heritage Trail. Walk trails and picnic facilities. Westonia is nestled inside a common of approximately 5,600 hectares of remnant bushland. Boodalin soak is situated in a natural setting of tranquil beauty inside the common approximately 6km west from the Westonia townsite. It has great historical significance and was a resting place for travellers from York to Kalgoorlie. There is an outcrop of granite rocks in close proximity. The well is fenced in a cleared area surrounded by newly planted trees. The stonework is an example of a dry stone wall construction in a circular fashion. Situated 12km south from Kondinin on Sloan Road. Surveyor general John Septimus Roe was the first European to have visited Yeerakine Rock, camping there on September 22nd 1848. From the top of the rock outcrop he could plan his route ahead, and his party was grateful for the good water they found there.Today, you can enjoy the expansive views from the summit – and you can appreciate the workmanship in the rock catchment scheme establiched in 1927 to provide water for Kondinin. To commemorate the ANZAC centenary, a Light Horse Memorial silhouette statue has been erected on the rock from which dawn ANZAC services are held to honour those members of the Light Horse Brigade from the local area who didn’t return from the First World War. Situated 25km north of Tammin the granite outcrop is 341 metres high and covers 160 hectares. A good access road to the base of the rock which is surrounded by largely untouched York Gum and Jam acacia woodland. The flora strip at its base is an important haven for flora and fauna.